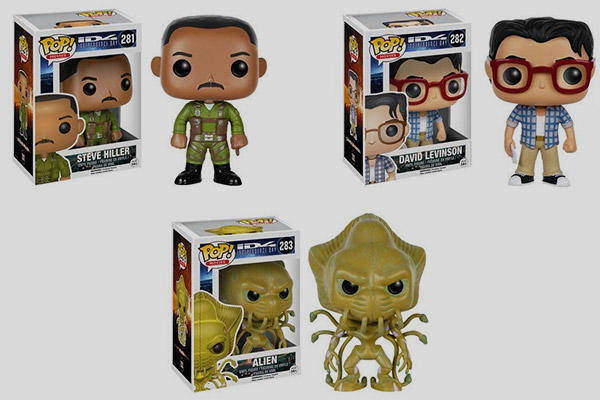 Independence Day: Resurgence has big shoes to fill when it comes to bizarre merch. 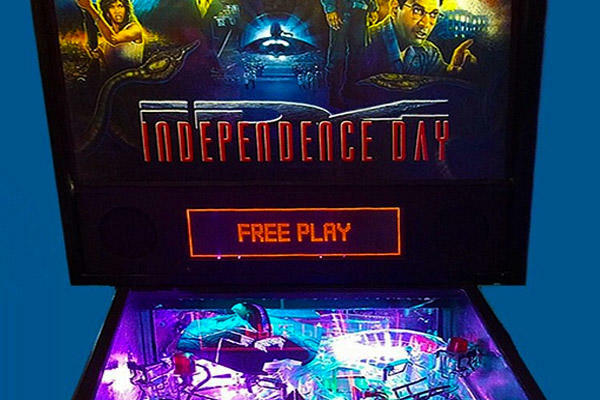 From pinball machines to battery operated aliens, here are our favorites. Independence Day: Resurgence debuts this weekend, but we're surprised there isn't more of a buzz! After all, the original film was absurdly successful; you can count us among the many who saw Independence Day in theaters way more than once. The shocking thing about Resurgence is how much of a true sequel it is. After 20 years, the studio could've gotten by on title alone, using an entirely new cast with only passing mentions of the original characters. Instead, we're getting role reprisals from Jeff Goldblum, Bill Pullman, and even Brent Spiner and Judd Hirsch. Now that's fan service! 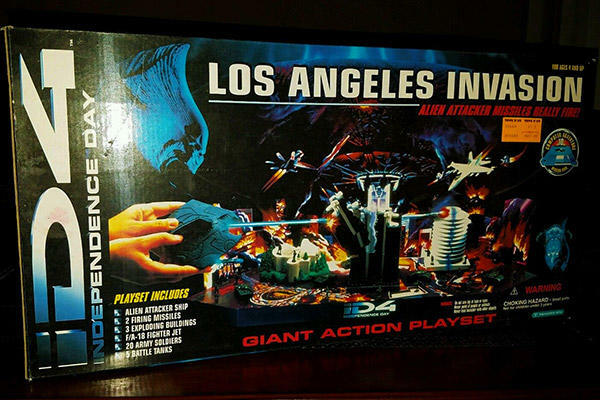 If you've forgotten just how big the 1996 film was, here are 10 ID4 collectibles found on eBay that show the extent of the pop culture saturation, covering everything from toys to gadgets to enormous pinball machines. This promo item was never available to the general public, and was likely Fox's way to woo press outlets and/or potential retail partners. 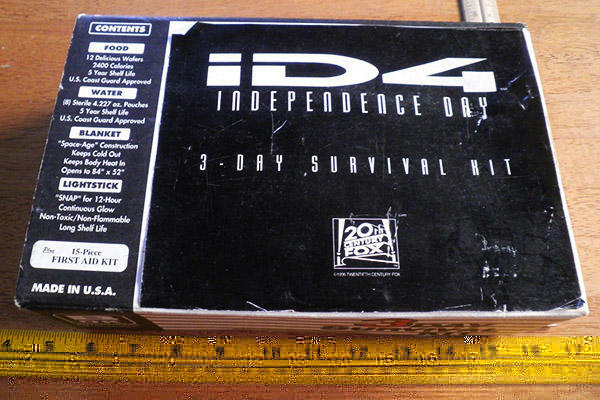 An ID4-branded survival kit totally fit in with the movie's plot, because you're never gonna survive an alien invasion if you don't have a lightstick and a bunch of adhesive bandages. The survival kit also comes with 12 "delicious wafers," which were said to have a 5-year shelf life. Let's see, if the movie came out in 1996 ... ick, sorry, but you can't eat those mystery cookies anymore. Naturally, ID4 inspired its own toy line, chiefly remembered for its big, battery-operated space aliens (more on them later). On the cheaper side were these standard action figures, mostly representing the heroes. 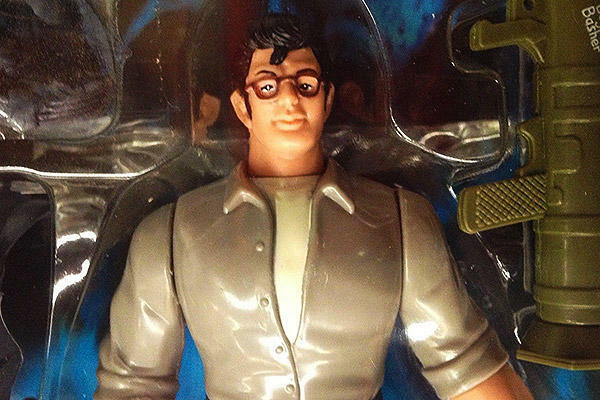 If this figure's likeness seems too rocky to identify, David Levinson was Jeff Goldblum's character. The figure looks more like Goldblum's stunt double, or perhaps an especially drowsy Clark Kent, but we think that just adds to its charm. The best pinball games look like miniature amusement parks, and we think this one fits the bill. It's loaded with ramps, tunnels and neon lights, and the idea of pretending that shiny metal balls are actually a series of Will Smiths seems totally worth $3,000. We suspect that this was another exclusive promo item. 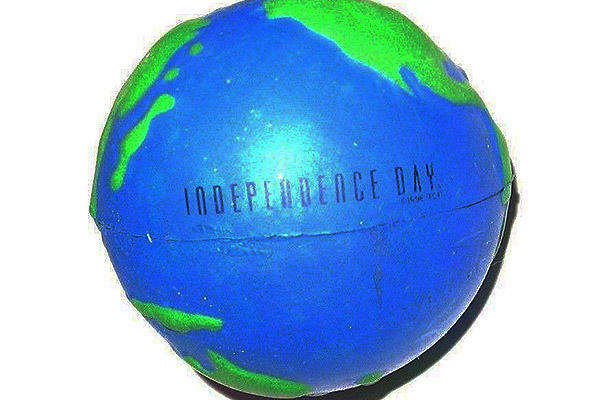 Independence Day was riotously successful, but we don't know if it merited its own line of branded stress balls. Thank God for the secondary market — we plebs would never have a crack at this stuff otherwise! 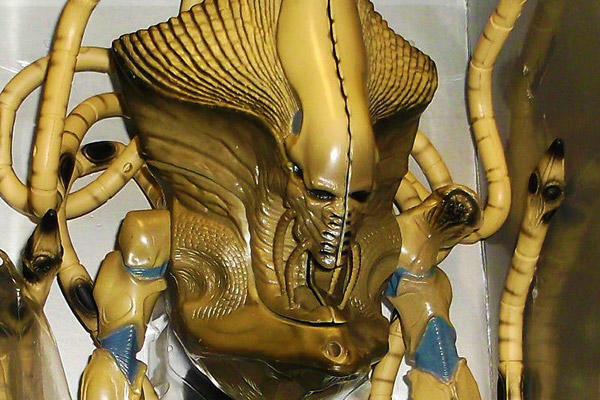 Arguably the most famous of all ID4 toys, the Alien Supreme Commander stood nearly a foot tall and made all sorts of disturbing noises. Explaining the full complement of its battery-operated features would take more words than we're being paid for, so we'll just point you to this YouTube demonstration. Yes, this was one bizarre plaything. Indeed, ID4 spawned its own video game. 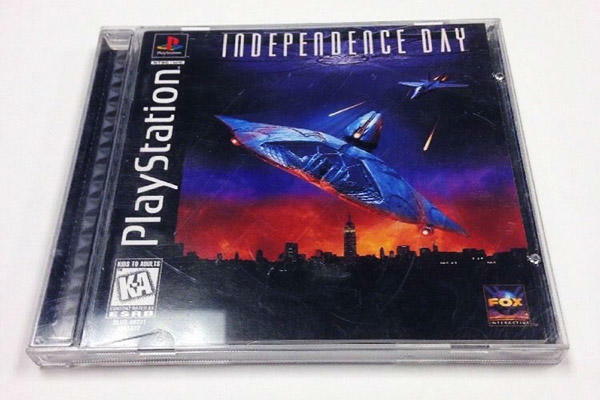 This Sony PlayStation title didn't receive high marks from fans back in the day, but we can only assume that a crude flight simulator with blocky alien ships has aged gracefully. Interesting note: While it would've been one of the most expensive items on this list back in the '90s, this game is now the cheapest, and it ain't even a close race. Many video games become "collectibles" and forever appreciate in value, but others are doomed to be yard sale fodder — no matter how old they get. Sorry, random ID4 game. You'll always be worth more than six bucks to us. It's a cool shirt for sure, but we're mostly into it for evidential purposes. People a bit younger than us seem to have trouble accepting that Independence Day really was a big deal, citing plot oversights and/or some undeniably hokey lines. The way we remember it, it wasn't exactly Jurassic Park, but it was pretty darn close. 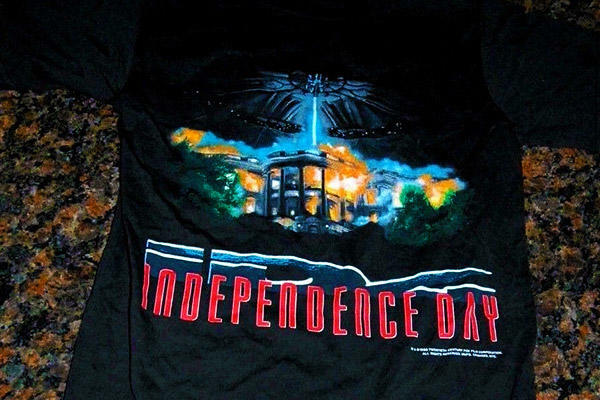 From now on, you can just point to the fact that people proudly wore shirts featuring the White House exploding as proof that ID4 was truly monumental. Yet another promo item, though this one is certainly much ritzier than stress balls or survival rations. Maybe not 190 bucks' worth of ritzy, but when you have something this rare, you can charge whatever you want. In the movie, Jeff Goldblum's character determines that the presumed "friendly" messages from outer space are actually counting down to a massive invasion ... so a digital "countdown clock" isn't just pretty to look at, but thematically appropriate! Note: This auction has ended as of this writing, but since it slid by without a bid, we expect the seller to try again soon enough. 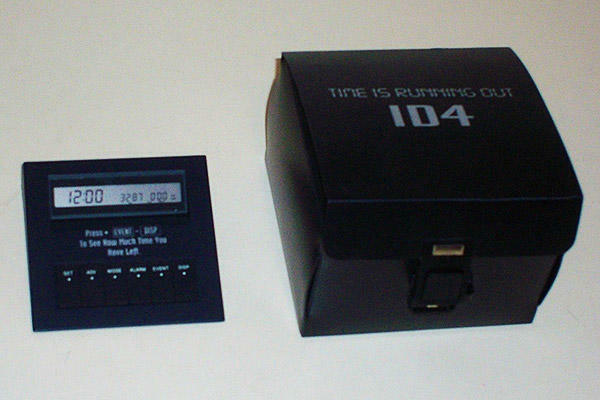 Who knew it'd be so much trouble to hawk an ID4 clock for nearly $200? These aren't vintage by any stretch. In fact, you might find them in stores right now! Funko has released a Pop! figure for just about every character ever created, so it's no surprise that the stars of ID4 found themselves immortalized as doll-eyed cuties with giant heads and tiny feet. This robust playset was pretty obscure even in its time, so we can't take issue with its high eBay price. For us, it's a total bucket list toy. It looks like the Independence Day version of an old Micro Machines playset, with all sorts of tiny alien ships firing on tiny army men while a series of tiny buildings collapse in the background. Give us this, a sandbox, and a Snickers bar, and we'll merrily regress. Independence Day: Resurgence probably won't summon the same sort of merchandise blitz as its cinematic papa, but it's still sure to become one of this summer's biggest blockbusters. What are your expectations for the film? Tell us in the comments below! I was a sophomore in highschool when ID came out and I thought it was the coolest movie ever. Time flies!